Another week is in the books. 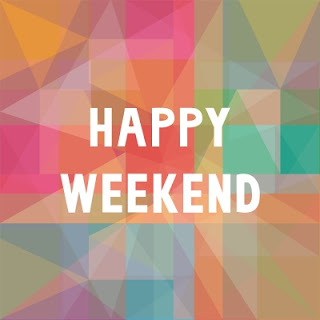 I have no idea where this past week went, but sure enough it's over. I headed back to work this week although this time it was back to my old stomping grounds in south Texas. I'll only be here until Tuesday of this coming week, but it was nice getting a chance to go back to an area that I worked in for nearly 2 years to see what's gone on. Oil boom cities are interesting to me. When I got to this area it was relatively early in the boom in this area which meant lots of development in the form of hotels and restaurants. Now that I'm back nearly 2 years after the oil bust many of the new restaurants are already closed down or changed ownership. There were about 5 new 150-200 room hotels built in an area with a combined population of around 7k with absolutely no tourist draw of any kind. I imagine many of those hotels will still do okay for the next few years as the production side works through all of the backlogs, but after that many of those hotels will likely be forced to close. I imagine there has to be some kind of financial incentive for whoever it was that developed those hotels, but developing in a boom town has to be risky. 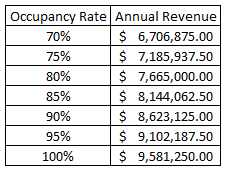 Let's take a look at some rough estimates for the economics of these hotels. Doing some internet searching brought up the average development cost for a 115 room hotel as $22 M. I'll assume that's the cost to develop these even though they are close to 150-200 room hotels because the cost of the land should have been much cheaper here plus I'm just doing some rough calculations. Assuming 175 rooms in the average hotel @ $150 per night here's what the annual revenues look like based on varying occupancy rates. The average net profit margin for the hotel industry a few years back was around 5%. I'll give them the benefit of the doubt and say that they are the best managers of hotels around and that they can squeeze out 7.5% net profit margins. Here's how the numbers play out. Yikes! Assuming these numbers are in the ballpark of the actual numbers, you're looking at 30-44 years of net profits just to recoup the development cost. And that's without even accounting for the time value of money and the lost opportunity cost of other potential investments or any debt required to finance the projects. Even if you assume the cost is 1/2 what I assumed you're still looking at 15-22 year paybacks. I don't know about y'all, but that doesn't look attractive to me at all. Speaking of poor financial decisions it still blows my mind how many people that work out in the oil field are absolutely piss poor with their personal finances. The oil field is a great place to make money, but as we all know it doesn't matter how much you make it's how much you keep. I was talking with one of the guys out here over this past week and he was talking about how he needed to save up about $12k to buy something. Let me start off by saying that's great that he's saving up for it instead of just putting it on a credit card, but it's absolutely ridiculous to me that he was saying it would take him about a year to do so. Now the length of time might not seem unreasonable, but keep in mind this is someone that's making somewhere around $200k per year. Assuming about 40% of his income goes to taxes, which it should be well below that, he still has about $10k per month coming in after taxes. How in the world can it take you a year to save up $12k? What makes matters even worse is the fact that while we were talking about the oil field and oil prices he also let this nugget slip out "oh well I'm only making about $190k instead of $500k per year". What? You made $500k per year for at least 2-4 years during the boom and you don't have $12k sitting around? I know if I was making $500k per year for 2-4 years working would be the last thing on my mind now because I'd be well into FIRE by now. You would be better of looking at the cap rate for these kind of investments. If you are looking at the payback period - you are looking at it the wrong way in my opinion. Don't forget that with these assets you get depreciation on your taxes and appreciation for market value of the assets as time goes by. Admittedly it's been a long time since I've looked at real estate as an investment so I just threw something together really quickly. You're right that cap rates is the better estimate of real estate investment viability. 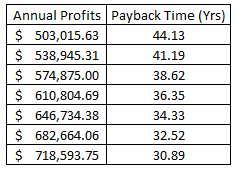 However, the payback period as I calculated using cost / estimated net income is just the inverse of the cap rate. In the 100% occupancy scenario you're looking at a 3.2% cap rate assuming you can maintain those levels forever. Although the big unknown is still the D&A. Regarding the appreciation I wouldn't expect this area to provide anything more than tracking inflation over time if there's no drilling in the area because there's no draw to push up prices here since there's literally no reason to come here unless you have family here. The big question here is how long the useful life of near max occupancy because as soon as the oil field stops in this area there's no way a town sister city area of about 7k population with no attractions can support that many hotels. Admittedly though I doubt the cost to build these hotels was close to $22 M but I just wanted to get a rough estimate. Keeping everything else the same except lowering the cost to build to $6M still only gives a 10%+ cap rate assuming 85%+ occupancy rates. In my opinion you better have a good pulse on the oil field in that specific area to have a good guess at the how long you can maintain high occupancy rates because at some point in the future they're falling off a cliff. All the best and hope you have a great weekend. Well written article. Thanks for sharing. Keep posting. Yeah it was definitely a rough estimate. The payback period, as I calculated it, is essentially the inverse of the cap rate. Also keep in mind that I'm assuming they are pulling in net profit margins 50% higher than the industry. Anyways, I should be free this evening if you'll be available. We need to catch up. Oh man... agh, that pisses me off! I can't believe he let that slip. $500 fricken K a year for a few years? I'd be done, completely done!!! WHY!!?!??!?!?!?! Yeah it really blows my mind just how bad so many people are with their finances. I couldn't believe that when he mentioned it.